Phoenix OS is an operating system made for PC’s running Windows and we’re going to Dual Boot it. Dual Boot Phoenix OS : What Advantages we get? Phoenix OS consumes less ram when compared to most Windows Distributions like Windows 8/8.1/10. When Android can run smoothly in Mobile Devices then it can outrun in PC’s with obvious Higher Configuration. Phoenix OS is designed in x86 Architecture so it can run smoothly on any Intel based computers, . The best part of this tutorial is you need not sacrifice your good old slow Windows Operating System. Dual Boot Phoenix OS runs parallel without any Problem. Very good choice for laptops having low hard drive space. Recently market is flooded with less storage cheap laptops offering hard disk space around 32-64 gigs. They’re comprised of SSD’s which are quite faster than normal HDD’s but in some cases, dual boot Phoenix OS helps us a lot. Right click on the Un-allocated Free Space and select Create New Simple Volume. 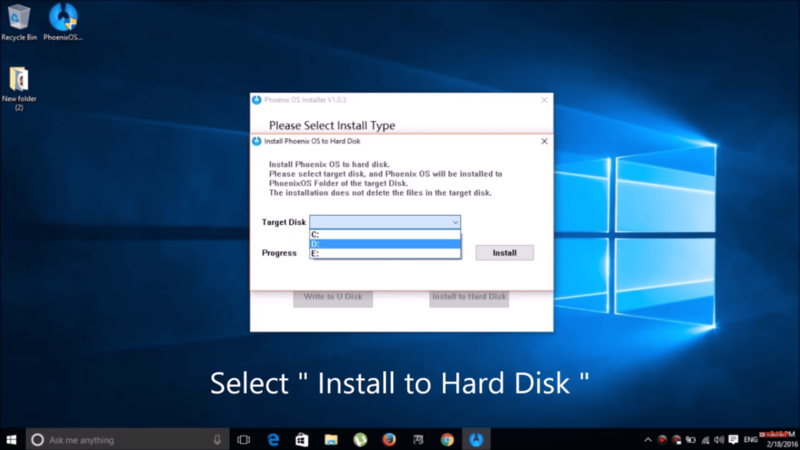 Open previously downloaded Phoenix OS Installer and Select the Target disk which is Obviously the Newly Created Partition. Or you can go with any drive as I’ve said earlier. Finally, select ” Install to Hard Disk ” option and wait for 5-10 Minutes until the Phoenix OS Installer finishes the Extraction Procedure for our Dual Boot Phoenix OS installation. After that you’re good to Go. 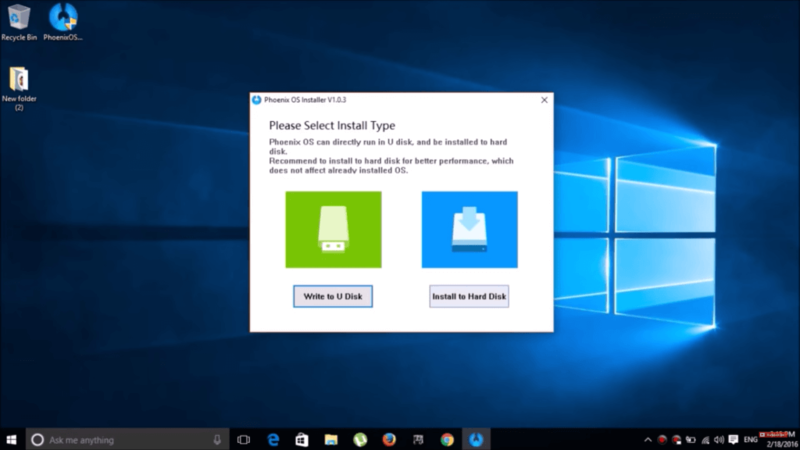 To boot into Phoenix OS Installation, you need to Restart the PC and you’ll find a Successful Dual Boot Phoenix OS Installation. Every time you start your PC you’ll get both Windows and Phoenix OS installations to choose from. I think Phoenix OS worth give a try. by the way congratulations for the new blog. I will keep visiting here often. Thanks for Commenting. Also do check my YouTube Channel for more video tutorials like this. Link is in Navigation bar or you can find it in Sidebar Social Widget. As USB devices like Flash Drives are comparatively slow when compared to hard disk present in our PC. That’s the lag has happened. Nice to hear from you. Support the site my following to Social Networks and subscribing to YouTube Channel. Nice post and thanks for sharing it with us. Great Post and Nice Article. I had never known about this before. I like it. It’s Raj here found your new Blog. It’s good to see you back in Blogging again. Heads up for your work. Kepp doing like that !! Thanks Raj. I’ve gone through your blog recently, and found very interesting articles. Expecting more from you. Dual boot operating system has been quiet popular during Microsoft XP. But today we have little options for that. Still many use dual OS like Windows 7 and Windows 8 for their convenience. I have installed windows and ubuntu on my machine with ubuntu as the boot loader. If I install phoenix os on myy harddisk without creating a new partition, will it replace the current boot loader or the ubuntu bootloader will add it to its list of operating systems? Hi, I installed Phoenix OS but when I get in to the Phoenix OS boot menu I only see windows and another system I installed (Remix), but no Phoenix. I installed each system on a separate partition. So to be clear I can boot to the Phoenix boot menu, but the menu does not show the system itself. Hope anyone can help me out. When you Installed Remix, it had modified you Boot options to display Remix on top of Windows, So it might have affected the Phoenix OS. Deleted everything. And did the Phoenix install again. Still got the same problem. When in Phoenix boot menu i pressed on ‘e’ while selecting the remix os . Then i got to a page command prompt like page with code (i think i was in the Grub). Changed all the ‘RemixOS’ into ‘PhoenixOS’ and Phoenix OS started booting and worked fine. But when rebooting i had the same problem and had to change it all again. Do you have any idea how i can change it permanently? Post your query in Phoenix OS forums. They might fix your issue. BTW Thanks for helping me!!! Unable to understand your comment.